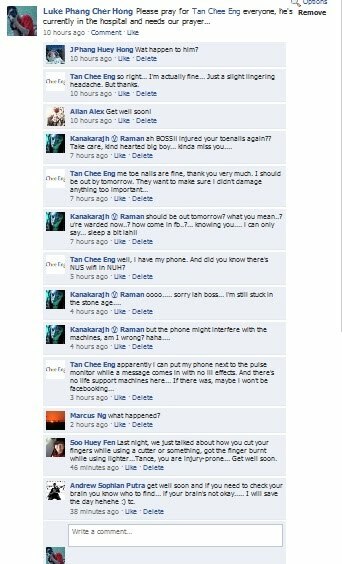 Okay, i guess i totally overreacted with my last blog post regarding my friend, Chee Eng who had a bad fall on his head. And also not forgetting about the Facebook status update that made it sound like Chee Eng's condition was so bad as if he's halfway to heaven already. But on the bright side, i have never got so much replies to my status update in Facebook before. At least i know people do read my Facebook status updates. It's been a long time since my status update attracted so many people. The only time when more people spammed on my profile was the time when my status read "I am Handsome". But that was ages ago. A word of sorry first to all the people who at first thought that Mr Chee Eng was seriously injured thanks to all my efforts in the cyberspace. When you're not a medical student, it's actually very easy to hit panic mode when your friend keeps asking you the same question over and over again. You're bound to be afraid that he's not going to remember your name again and the 100 dollars that he still owes you. Seeing a friend lose their memory is not a very fun thing to watch, you know. It's actually quite scary. Well, at least after this incident, i know now that it is very normal for a person to lose some memory if you get hit hard enough on the head. Looks like all those amnesia cases often portrayed in those soap operas i used to watch as a kid is true after all. The next time if a friend of mine falls and hit the head again, at least i already know what should i do. Keep reminding him/her of the 100 dollars he/she owe me. p/s: Look on the bright side Chee Eng, i found you a new nickname! 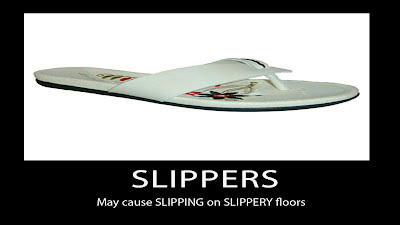 Oh, and in addition to that, i think we found how the name of slippers came about today. 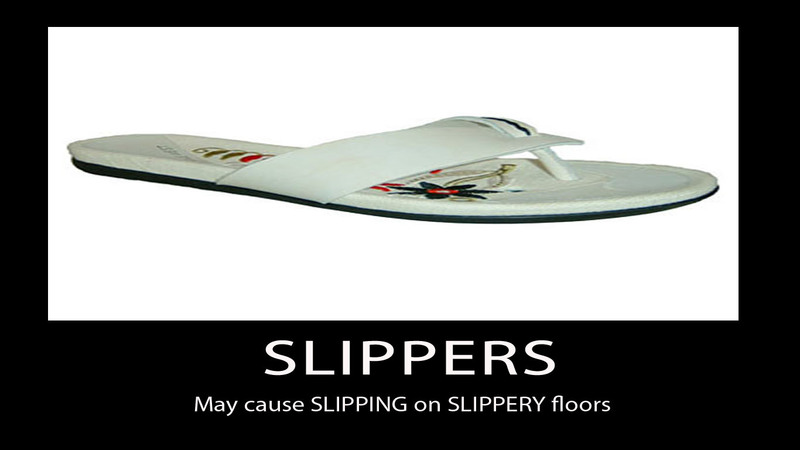 They call slippers slippers because when you're wearing them, you're bound to slip and fall most of the time.So please be careful the next time you're wearing slippers and walking on a slippery floor. Not a good combination. Someone owe me RM30 but he seems forgot about it, lols! No, he did not fall and hit the head. You're a bit out if luck, i keep records of who owes me money and who i owe money to... But anyway, i (think) i still remember everything except what happened from just before i slipped. Anyway, i was reading my patient records this morning, and too be fair to you, your last post didn't sound *too* much worse, what with the impact on the left occipital, loss of consciousness, amd rolling of eyes upwards... Aside from the health implications, having my brain segfault is actually quite... interesting.